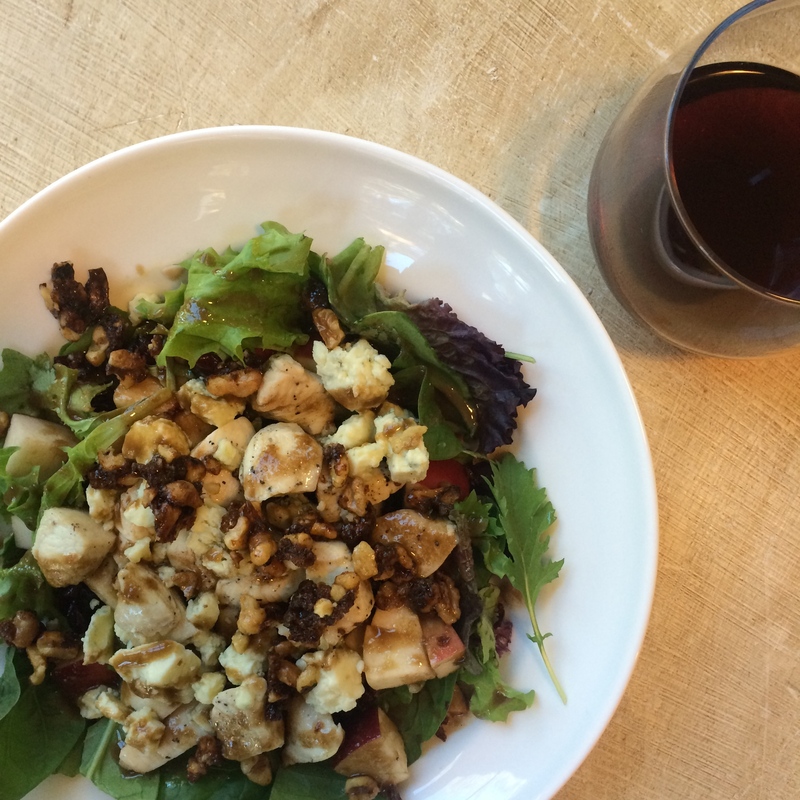 I put this salad together for the first time on a Saturday that we were running around like crazy and finally had a “parent break” in our day to have a quiet lunch and a little glass of wine. I’m always a fan of a big salad and this one combines several things I really like: blue cheese, apples and candied pecans being the big ones. I’ve also found that I really like making salad dressings at home. Bottled dressings are often a little sweeter than I like (although I do like this brand) and, when I have time, I’ve put together homemade combinations that are a little more citrusy, or have a little more of a spice or bite to them. This is one of those random combinations and it balances the sweetness of the salad fixins very well. For dressing: Combine all ingredients in a small food processor or blender until emulsified. Put in refrigerator until ready to use. You may need to whisk it up to combine again, depending on how long it sits. For chicken: Cut chicken into cubes. Season with salt, pepper and lemon pepper. Cook in a skillet until browned and cooked completely. Allow to cool slightly before serving. Place spring mix into two bowls. Top with a handful of craisins, sprinkle on desired amount of pecans and blue cheese and apples. Add chicken. Drizzle entire salad with desired amount of balsamic dressing.